A “true” false carpet, inspired by the geometrical scalloped designs on the rugs of the semi- nomadic tribes living today in NE of Turkey. 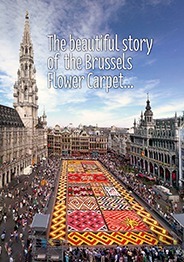 The Flower Carpet was made up by a succession of the same motif in alternating colours on two parallel strips surrounded by a wide border. In 1998, Mr E. Stautmans could give free rein to his love for decoration and ornamental motifs. He imagined a “true” false carpet- his last one- inspired by the geometrical scalloped designs on the rugs of the semi- nomadic tribes living today in NE Turkey. 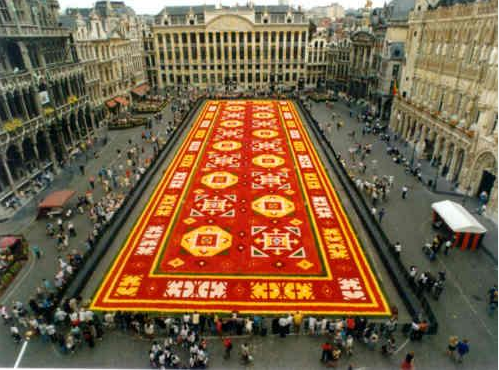 The Flower Carpet of the Grand’Place (77x24m) was made up by a succession of the same motif in alternating colours on two parallel strips surrounded by a wide border. That year the carpet for the children displaying “Mickey Mouse” moved to the “Bois de la Cambre”.